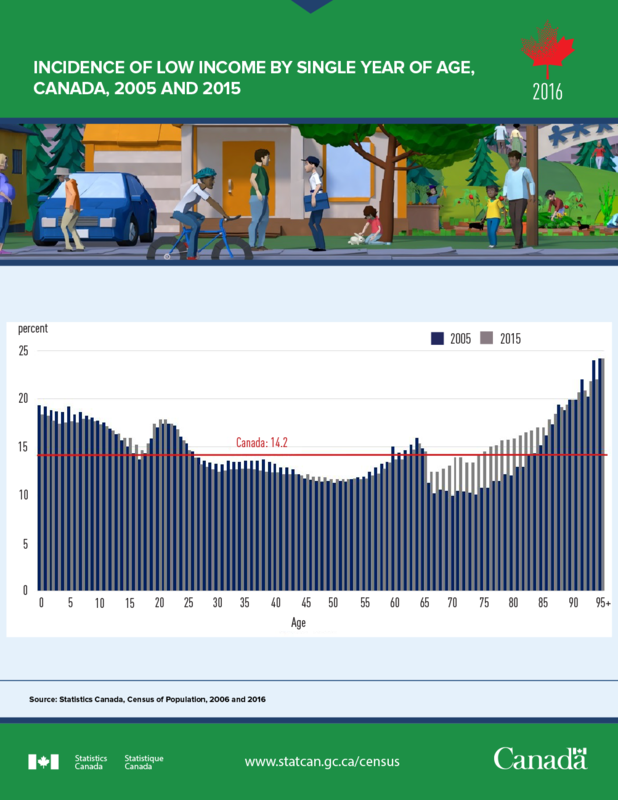 The title of the infographic is "Incidence of low income by single year of age, Canada, 2005 and 2015"
This chart shows the change in low-income incidence for Canadians of different ages between 2005 and 2015. The horizontal axis marks the different ages, starting from age 0, up to age 95 and older. The vertical axis shows the incidence of low income—that is, the proportion of Canadians who had low income. It varies between 0% and 25%. A result of 0% means no one had low income, while 25% means one-quarter of the population had low income. There is a horizontal line on the chart labelled "Canada: 14.2." This is the incidence of low income in 2015 for Canada overall. It means the proportion of Canadians with low income was 14.2% in 2015. Along the horizontal axis at each age value, there are two vertical bars in the chart. The first represents the incidence of low income in 2005 for that age, while the second bar indicates the incidence of low income in 2015 for the same age. The chart shows that, relative to persons aged 25 to 55, the incidence of low income was higher for young children, youth, pre-retirees, and seniors aged 80 and older, in both 2005 and 2015. However, during the decade, the incidence declined for children aged 5 and younger, and rose for Canadians aged 65 and older. For persons aged 0 to 12 years old, the incidence of low income decreased, especially for children aged 5 and younger. For persons aged 13 to 21 years old, the incidence of low income increased marginally, while, for persons aged 22, there was no change. For persons aged 23 to 44 years old, the incidence of low income decreased marginally. For persons aged 45 to 53 years old, the incidence of low income increased marginally. For persons aged 54 to 65 years old, the incidence of low income decreased marginally. For persons aged 66 to 87 years old, the incidence of low income increased sharply. For persons aged 88 and older, changes in the incidence of low income were somewhat mixed.